Home > Articles > Forex Education > What is a lot? A lot is defined as a unit of the transaction size used in trading and is one of the important elements of risk management. The size of the transaction or the lot value changes from one market or security to another. Lot is also known as a contract size and is how securities are generally traded. The lot size that you choose should ideally be determined by your account leverage, risk management and equity. In this article, learn more about what are lots, how to use lot sizes in trading and settings for using a default lot size in the MT4 trading platform. What is a lot?. In Forex, a standard lot or a lot is measured as 100,000 units. The table below gives a break-up of the different lot sizes. Depending on your account equity and leverage, the maximum lot size can vary as well as the pip value for 1 pip as shown in the table below. 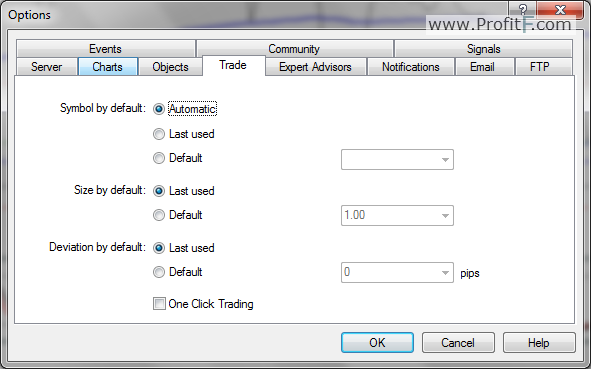 Traders can set a default lot size in MT4. To set the lot size, click on Tools>Options or press Ctrl + O and select ‘Trade’ tab to enable the pop up window. In the trade settings window, you can check the ‘Size by default’ option, select ‘Default’ and then enter a default lot size (1.00 = 1 lot, 0.01 = 1 mini lot, etc). This ensures that every time you place an order, the default lot size is automatically selected. The lot size that is used to trade new positions will vary based on your risk aversion profile as well being defined by the trading strategy you follow. Most beginners usually tend to randomly make use of various lot sizes on whims and fancies. Having an understanding of the risk management and the lot size therefore can be greatly beneficial. For example, one of the common risk management strategies is not to risk more than 2% of account equity. Going by this logic, assuming that a trader has $100,000 account equity then maximum allowed amount to risk would be $2000. Based on the risk information, we can deduce the pip value deviation as shown in the table below. As evident from the above table we can notice that depending on the lot size opened the amount of leeway that can be given vastly increases. A 0.1 lot offers much more flexibility compared to 1 lot when it comes to both risk management and pip deviation. Which lot size is best? While the answer to the above can vary from one trader to another, it is always advisable to choose a forex broker that offers micro lots. Some forex brokers usually offer a mini lot as the minimum standard lot based on the account equity with a minimum deposit of $10,000 and above. In conclusion, understanding lot size is important to managing risk in forex trading. Therefore, choose the lot size that you trade with carefully. You are here: Home > Articles > Forex Education > What is a lot?